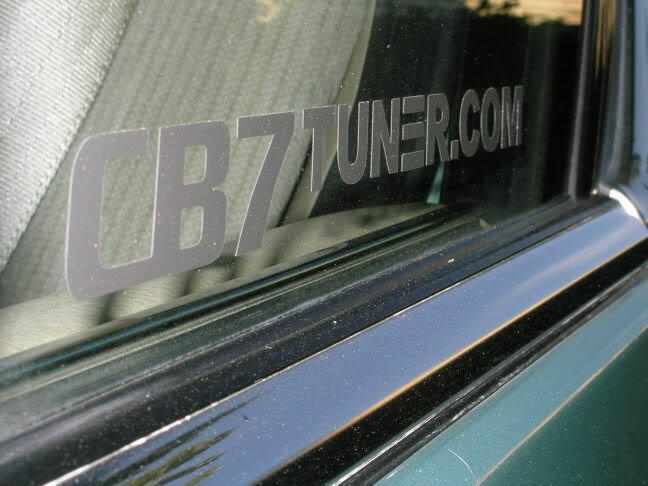 The only place to find authentic CB7tuner.com merchandise! Welcome to the official CB7tuner.com store. Here, you can buy official merchandise such as t-shirts and decals. Paypal is the only method of online payment that I will accept. Unless otherwise mentioned, all items are priced with shipping charges included. Some items, such as t-shirts, are more expensive to ship internationally... so PLEASE choose the correct payment option when ordering! Your payment will be refunded, and your item will not be sent, if you choose the wrong option. Shipping may take up to a week, as I do this in my spare time, and work a very demanding full time job. If you have not received your order 3 weeks after ordering, please contact me via PM, and I will figure out the best solution (or just apologize for being lazy and ship it out ASAP!) Please do not ask about your order status sooner than 3 weeks. The return policy is simple. There is no return policy. All sales are final. 7.75" long, 1" tall at the tallest point. $5 per pair, shipped worldwide. Please include your username with your purchase. High quality Gildan T-Shirt. CB7tuner.com logo professionally screen printed in 3 colors. $25 shipped to continental US. $30 shipped to continental US.